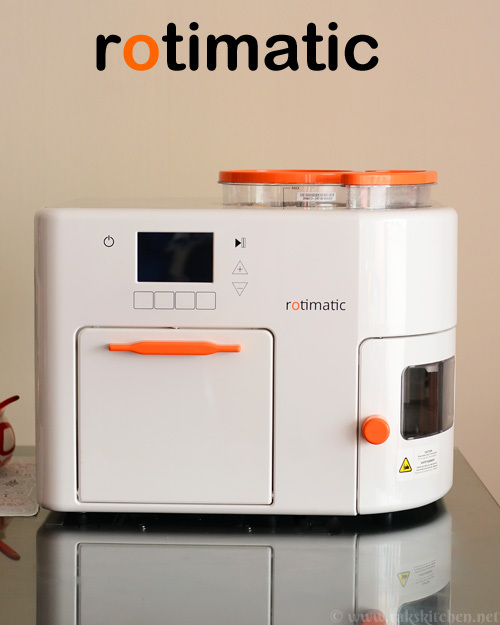 Rotimatic review, all your doubts, questions, enquiries, doubts answered in this post with as much as possible detailed information.What is Rotimatic? 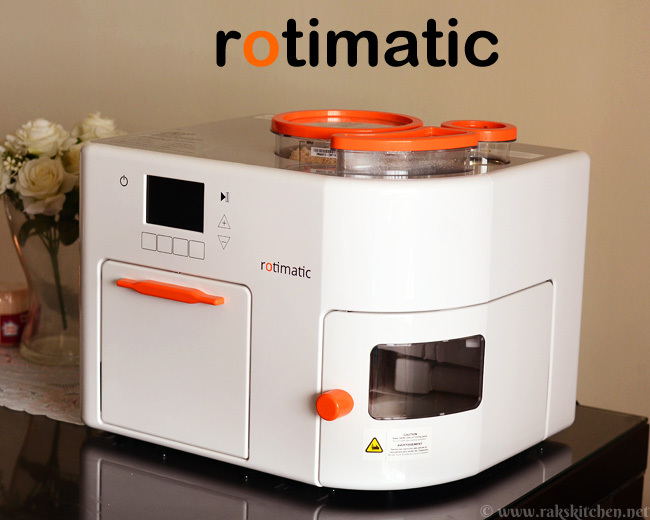 Rotimatic is a machine in which you can make hot rotis all automatically. Just fill flour, water, oil in respective containers in the machine, set the thickness, roast level and number of rotis. You can sit back and enjoy your time with your family or do your work, the Rotimatic does the job for you.More interestingly they have other options to make puri (just gives you uncooked flattened ones, which you have to deep fry), pizza too.Rotimatic is available now in Singapore, UK, US, Canada, Australia and Gulf countries.Two main questions that raise as soon as you hear or see Rotimatic – Taste and cost.Let’s first talk about taste. I won’t compare handmade roti with machine made roti. But I would say the rotis from Rotimatic does not have any artificial smell or taste. It is as flavorful as the handmade ones. Tastes the same too. Though the thickness of the roti is more than the handmade ones. I smear little ghee just like I do for phulkas and keep inside hot pack. This helps the rotis turn softer and stay soft. No crispy or hard rotis. Each Rotimatic rotis puff consistently. You know puffed roti means soft rotis. Now the cost. Is it worth to buy? It costs 999 USD. Yes, it is expensive. Because it’s a new invention in the market for a Smart Kitchen – imagine how expensive washing machines and smartphones were when they were first introduced.But it is up to you to decide. If you choose comfort over cost, then no issues here. Think about eating outside, if you’re eating out 4 times a week, that’s $320 spent a month; you could’ve paid off your own Rotimatic in a little over 3 months of takeaway food. You opt for takeaway or using frozen rotis just because you are too exhausted after work, after a day out or even after a long day of work at home cooking throughout the day? Preparing dough, rolling out and cooking under humid conditions. Here you just need to fill the containers and just concentrate on a sabji, dal or any gravy to go with rotis. You can even prepare the side dish in the morning so that evening you can feel relaxed about dinner preparation. You know what goes inside the roti, you can make it nutritious, while in takeaway or frozen roties, you can’t decide what goes into their rotis. So, these two are your main concerns that raise first when you hear about Rotimatic.After you decide to buy, you must be thinking about how it fits into your kitchen – the space, weight, noise. Rotimatic is bulk, occupies some space just like a wet grinder. You can have it placed just near your dining area so that it is easily accessible.Noise is in between a washing machine and a blender. Me or my family didn’t find it annoying. At least as of now where we just watch the machine do the work curiously. People who have babies or who prefer silence may find it noisy but remember while your Rotimatic is busy preparing rotis, you can enjoy your time away from the machine, so that it is not an annoying noise if at all you are sensitive to that noise. I have a discount link for my friends/ followers, so if you want to buy, you can use this link and get a 75$ off! You need not worry about the recipe, nor the measurements. Just fill the respective containers, you get a consistent quality rotis at home every 90 secs. Though it’s machine made, you know what ingredients go inside. No nasty preservatives or anything! It is not only used for making rotis. It can spread and give you, equal sized Puri and Pizza base. So, it is Rotimatic, Purimatic and Pizzamatic. For the latter two, the Rotimatic will make you the base and you’ll have to pop it in the fryer or the oven to cook it to your liking. With more upgrades in the pipeline, that will be automatically sent to your Rotimatic for free in the form of notifications and software upgrades. You can get creative and use this option to make spicy Diamond cuts, Shakkarpare, Namakpare or even there are people who make stuffed roti by using the Purimatic option. There is even a group on Facebook where proud Rotimatic Owners share their creative recipes for your inspiration: https://www.facebook.com/groups/RotimaticOwners/ I personally hate the kneading part when it comes to traditional roti making. If I use hands for kneading, I use gloves to avoid messy hands. If doing it in bulk, I used to use my wet grinder’s atta kneader attachment to avoid kneading. So, I love Rotimatic for this main reason, it’s a single machine which kneads, flattens and give you a cooked roti. Bachelors or newlyweds new to Roti making or struggle with cooking or making the perfect round rotis should definitely invest in a Rotimatic. It is a pretty value for money and the fact that you can get 24/7 home-cooked food makes it even more worth it! No more sweating while kneading, cooking the roti near hot stove. You too can enjoy your cozy time with your family while the machine does the job for you. You need not carry the machine in case you run into trouble, the Rotimatic’s Wi-Fi connectivity feature and app means that they can run remote diagnostics and send troubleshooting advice your way, all remotely! Just in case. All the parts are dishwasher safe. Cleaning is not too complicated. And no need to wash before first use. Even though I choose thinnest possible setting, the thickness is more than what I make with hands. The structure of the roti is two outer thin skinny layers and a thicker middle layer. I Wish the machine is flexible and allows me to add ingredients like finely chopped onion, carrot, spinach, etc, so that we need not buy dry powder ingredients to use in the machine. Also, I wish they have an option so that we can choose the steps, kneading and rolling alone, heating alone (so that we could roast papad, toast bread, bake pizza etc.) As a newbie, you might want to take notice on how to assemble the parts before washing it. There’s also a YouTube playlist on Rotimatic channel that help with this process here: https://www.youtube.com/playlist?list=PLcqvyyQ_8524Fy8MEPFAa04Mu_twsJiTmThe flour dispenser saves some flour in it which must be carried over next time. This could be something to note when we prepare other variety of roti, like masala roti where you’d require a mixture of flour and other masala ingredients. 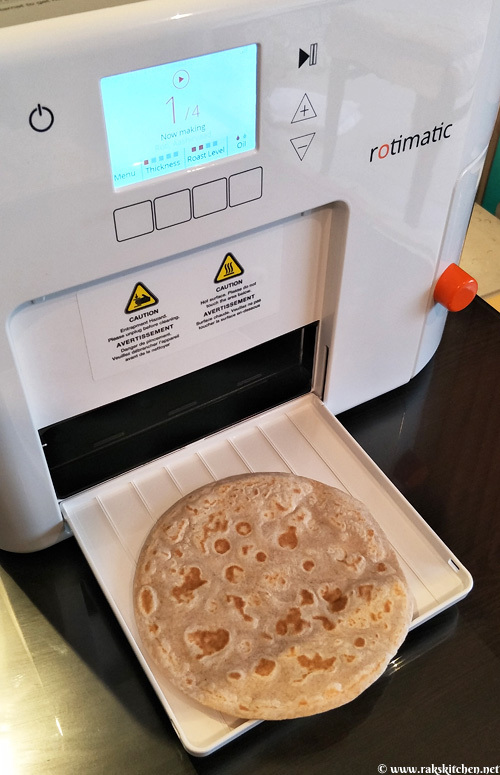 If you are used to or prefer homemade rotis, you can make perfect, thin, delicate, round rotis with ease, if you have time, patience and cannot compromise with any of these, this post is not for you, and the Rotimatic is not for you.If you are in India, Rotimatic is currently not available in India yet. The team at Rotimatic is working hard to bring the machine available to every country – just leave your contacts on the website to be the first to know once it’s available! :)I personally love Rotimatic because I feel it is a genius invention in an Indian field market. I cannot stop admiring the way it prepares the dough, rolls the dough, comes out as a perfect roti. I love to watch it step by step (I am one who wish to see what happens inside dishwasher while the dishwasher is running). So I feel proud that someone invented such an automatic machine that helps in an Indian kitchen and will keep thanking them forever! This post is a sponsored post, but the views expressed here are genuine, just like how I would share with my friends 😊 Feel free to let me know below if you have any questions regarding the Rotimatic – am happy to answer them all!